A 'souls-like' action RPG developed by Toadman Interactive, known for creating Bloodsports.TV. 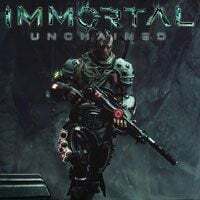 The game described herein resembles the Dark Souls series in many ways, however, in Immortal: Unchained the players use firearms instead of melee weapons in combat. Immortal: Unchained is an action RPG representing the 'souls-like' genre (the game resembles the iconic Dark Souls series). The game has been developed by Toadman Interactive, known for creating the cooperative action game called Bloodsports.TV. Among other platforms, Immortal: Unchained is available on PC, PS4 and XONE. The game tells the story of a living weapon – a human-like creature, who long ago has been locked in the eternal prison, where he was supposed to remain until the end of time. The world, however, is standing on the brink of destruction due to the incoming cataclysm, which can be stopped only by the main protagonist. The story has been written by Anne Toole (Horizon: Zero Dawn) and Adrian Vernishin (Killzone: Shadow Fall, Battlefield 1). A player gets to immerse into the story similarly to how he can do it in the installments of the Dark Souls series – by exploration and interacting with the encountered characters. Immortal: Unchained is a demanding RPG. Unlike other souls-like productions, the game described herein puts a strong emphasis on using firearms instead of melee weapons such as swords or axes. The combat revolves around medium and short distance battles and the key to success lies in player's mobility, positioning, and perfectly executed dodges. Even though the game requires one to prove his reflexes, it does not have much in common with the classic TPP shooters, such as Max Payne 3 – Immortal: Unchained is more similar to games such as The Surge and Bloodborne. Similarly to the Dark Souls series, during his adventure, player's character is bound to die very often. The developers from Toadman Interactive have implemented a solution, which is nearly identical to the one featured in the games created by From Software in order to soften the consequences of a failure. Most importantly, with each death, a player learns a new lesson, allowing him to perform better against certain opponents – one can learn enemies' moves, attacks, etc. Moreover, upon his death, player's character loses all his items, however, they can be retrieved after a player reaches the place where his character died – provided he does not die on the way there. Another aspect that is similar to the Dark Souls series is the in-game world design. The action of Immortal: Unchained for PC, PS4 and XONE is set in a fantasy world divided into a number of diverse locations, which are connected by a network called Stream.